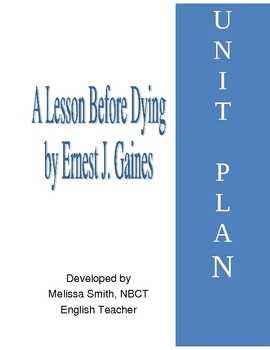 A unit of materials for Ernest J. Gaines' novel A Lesson Before Dying. This unit can be used for grades 8-12. Includes author biography, chapter questions, quiz (with key), study guide, final test (with key), essay questions, both independent and group activities throughout the unit, journal prompts, 5 additional poems to read and discuss that thematically connect to the novel, handouts for tracking character notes, writing assignments, etc.